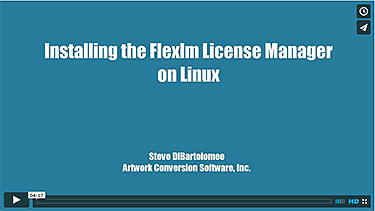 Below are two short videos: the first discusses the overall behavior of Flexlm and the second takes you step by step through the installation process. Note: If you are not an Artwork customer please don't ask us for this download; Customers should email us to get the ftp login and current password. Unpack the download and copy into a directory where you want the license manager to reside. One cannot simply use the Linux operating system's hostid command to obtain the hostid as needed by Flexlm. You must use the utility called lmhostid that is provided as part of the flexlm utilities. Here is an example. 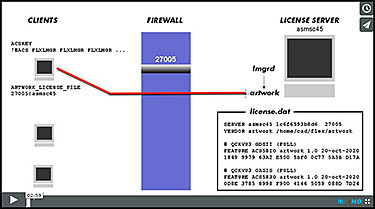 lmutil - Copyright (c) 1989-2006 Macrovision Europe Ltd. The FLEXlm host ID of this machine is "1c6f6593b8d6"
Clearly these are two different values and if you request a license using the hostid a8c09100 your license server won't start/run using the license codes we send you. This is a "sample" Please don't copy and paste this verbatim and email to us. I need floating license codes for your Qckvu3 program. I got this using the lmhostid utility.